When you are ready to export, decide if you will export the entire project, only the tracked panels or specific panels. If you are exporting to Flix, you can automate the process by using scripts. Select File > Conformation > Export Project. The Export Project window opens. In the Destination Path section, enter the name for the exported files and specify a folder. ‣ Export one image per layer: Keeps layers on separate images instead of flattening each panel’s layers into one flat image file. ‣ Always Nest Layers: Nests the scene's layers inside one single clip. When this option is deselected, layers will not be nested into clips and will export as individual video tracks. This is true as long as a panel has either layer motion or a camera move, as it is not possible to export both without nesting. If a panel contains both motion on layers and a camera move, the panel will be nested into the V1 track. option to nest your scene's layers inside one single clip. When this option is deselected, layers will not be nested into clips and will export as individual video tracks. This is true as long as a panel has either layer motion or a camera move, as it is not possible to export both without nesting. If a panel contains both motion on layers and a camera move, the panel will be nested into the V1 track. ‣ Export Camera Frame: Includes the camera frame’s black border. 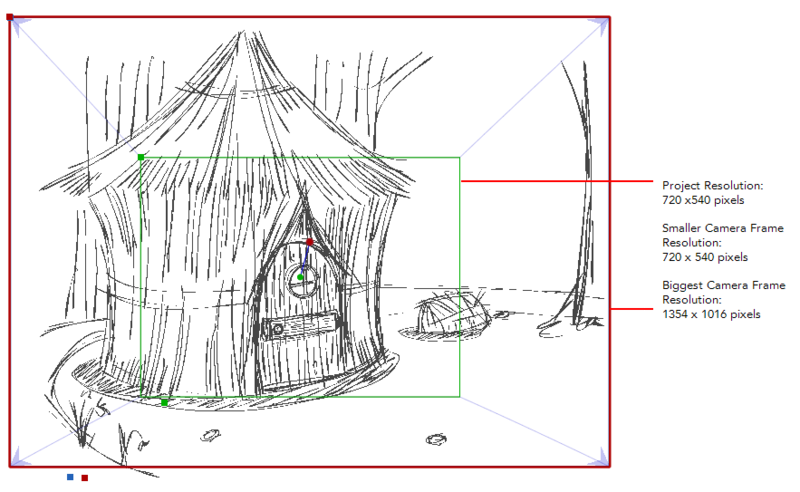 • Export markers at scene beginning: Places a chapter marker at the beginning of each scene. These markers are used to find the in point of each scene when conforming from Final Cut Pro to Harmony. The marker are named "Scene: NAME_OF_SCENE" and have a unique scene ID and chapter marker as their comment. 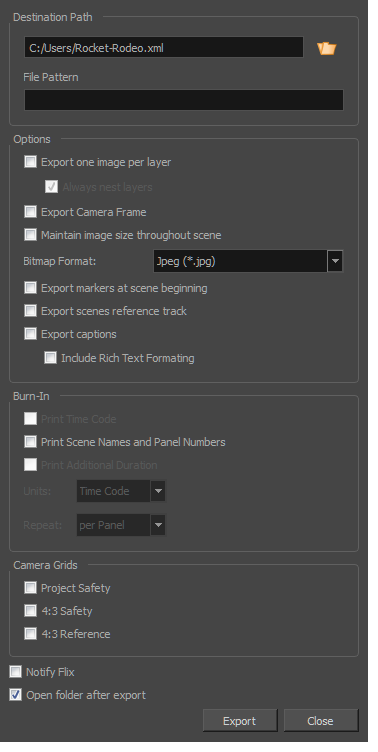 • Export Scenes Reference Track: Generates .png images with the scene named burned in. When exporting to Final Cut Pro, this option must be enabled. The track will be used by Harmony when conforming the XML from Final Cut Pro to find the scene in the XML. ‣ Burn-In: Adds information specific about the panels and their position in the Timeline. • Print Time Code: Prints the project timecode on the images as an overlay on your video. 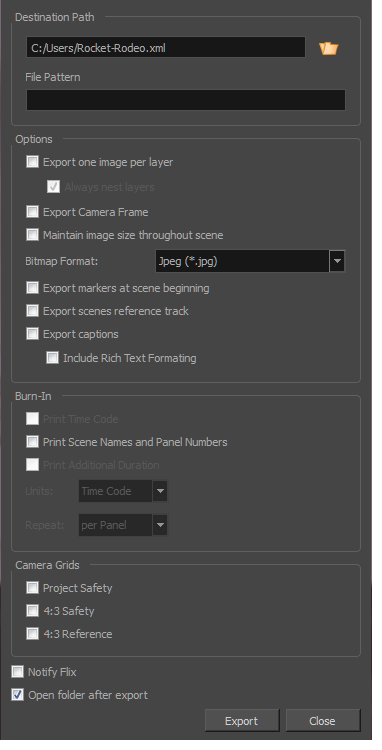 • Print Scene Names and Panel Numbers: Prints the scene names and panel numbers as an overlay on your images. • Project Safety: Prints the safe area on your video. • 4:3 Safety: Prints the 4:3 safe area on each panel of your storyboard that has a camera movement. • 4:3 References: Prints the 4:3 area on each panel of your storyboard that has a camera movement. Select the Notify Flix option to so it will automatically update its asset database. Note that Flix must be installed on your computer. Select the Open folder after export option to open the folder where the files are stored when the export is complete. In the Thumbnails view, select the panels you want to export to a third party software. Select File > Conformation > Export Selected Panels. The Export Selected Projects dialog box opens. Set your export options in the Export Project dialog box. Once you have tracked panels in your storyboard project, select File > Conformation > Export Tracked Panels. The Export Tracked Panels dialog box opens. Set your export options in the Export Tracked Panels dialog box. • TB_ExportAllPanelsToFlix: Exports all panels in your storyboard project to Flix. • TB_ExportSelectedPanelsToFlix: Exports selected panels in your storyboard project to Flix. • TB_ExportTrackedPanelsToFlix: Exports tracked panels in your storyboard project to Flix. You can also use the TB_SetFilePathForExportToXML script to reset the path of the export. To add scripts to the Scripting toolbar, see Linking Scripts to Toolbar Buttons. For more information on scripting, see About Scripting.